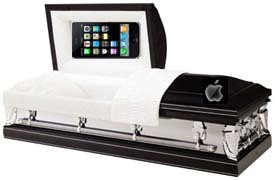 Steve Jobs shocked the world today by abandoning Apple's long-awaited iPad tablet in favor of the iCasket, a high-tech coffin that allows the dead to send text messages, download books and install apps. "This is a game-changer for the funeral industry and the afterlife," said one analyst. "Well, unless cemeteries refuse to add WiFi."